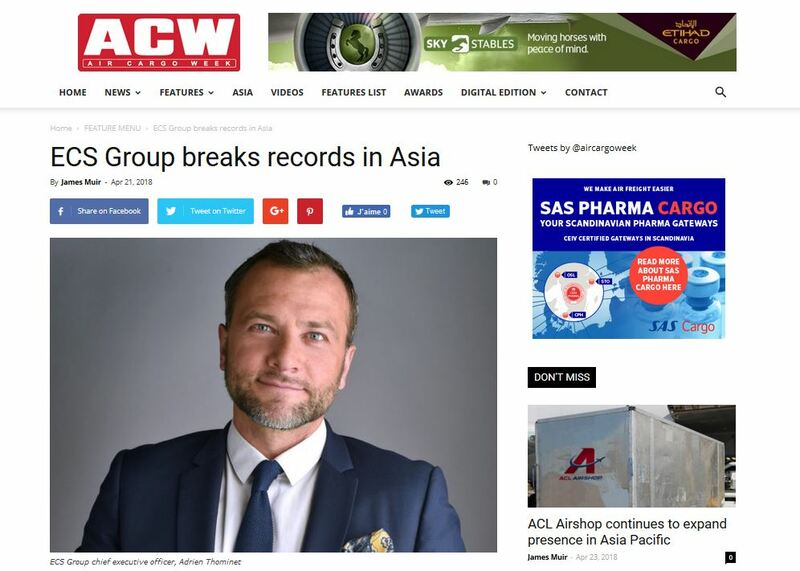 The Asian market is booming for ECS Group helped by major contracts with important players in the region, chief executive officer Adrien Thominet (pictured) tells Air Cargo Week. India in particular had a record year because ECS handles Saudia Cargo, which operates to 18 destinations in the country. Thominet says ECS is the largest organisation in India with 18 offices and more than 120 people. ECS has also been busy performing charters working with Saudia to Brasilia for pharmaceutical products. The acquisition of AVS, which represents DHL is also proving very important, as DHL is also adding capacity to the market. Thominet says load factors are 100 per cent on the DHL flights in the capacity provided to ECS, making him a very happy man, calling it a “very satisfying set up”. The rest of the Asian market is also performing well with ECS’s partner, AVS, which it purchased in 10 other countries, which have proved “outstanding” with a 22 per cent increase out of Asia. “No one would complain” he comments. The AVS acquisition has also proved very helpful providing “immediate synergies both ways”, something which Thominet believes is very important after an acquisition. AVS also brought connections and contracts to the group thanks to the network. He describes it as a “reciprocal synergy”, paying back the value of the purchase immediately. ECS has grown around the world by acquiring the largest setup in the region, a company with significant market penetration, with Thominet pointing out that it is an “added value”. Thominet says that this means that when an airline is selecting ECS as a partner they are guaranteed increased efficiency. Acquisitions are made individually of the strongest players.